THE Under-21 champion of the Cuestars South Wilts Snooker League slipped two places to sixth after the final two re-arranged games went against him. Fordingbridge teenager Anthony Rice (pictured) ended his debut season mid-table. 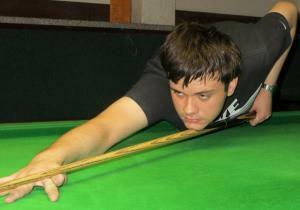 The 18-year-old dropped from fourth to fifth when Steve Ashton defeated Ally Pollard 5-0 at Salisbury Snooker Club. And then Paul Burt went above him on the head-to-head rule following a 4-1 victory over Trevor Pittman. As previously reported, John Hunter claimed his ninth title and recorded the highest break of 121. Richard Swaffield finished six points adrift in the runners-up spot. Rice was the highest placed under-21 player. The only outstanding fixture, between Alex Thorn and Martin Hill, which was understandably postponed, does not affect any other league positions. Results: Paul Burt 4 Trevor Pittman 1, Steve Ashton 5 Ally Pollard 0.